Justin Bieber’s official DJ — DJ Tay James has really taken things up a notch with his latest We Know The DJ Radio Vol. 4 project. 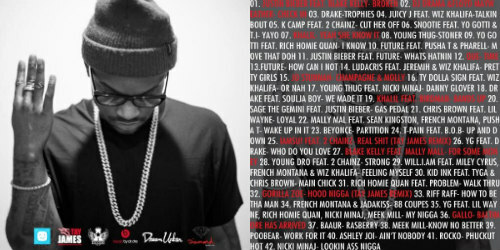 The 42-track tape opens with Broken by none other than Justin Bieber and Blake Kelly and then carries through with features from Drake, Nicki Minaj, Rocko, Khalil, Ty Dolla $ign, Wiz Khalifa, Juicy J, and more. But it doesn’t stop there! Download and find out what else DJ Tay has managed to master together. Wow, I don’t see much of Justin’s songs. Wonder why justin doesn’t have most his songs on the mixed tape then his songs. I love “Broken” it is such a dope track! I also love that it sends a strong message to his haters that they will never break him! Keep strong Justin! JUSTIN BIEBER HAPPY BIRTHDAY 20 I CANT BELIEVE IT THAT YOUR 20 ITS A SPECIAL NUMBER , I LOVE YOU AND I WILL NEVER LOSE FAITH IN YOU, I HAVE MEDICAL PROBLEMS. I will luv to download the mixtapes. Luv you Justin. Happy 20th Birthday Justin.